“Never get so busy making a living that you forget to make a life.” That inspirational quote was said by country music legend, Dolly Parton. Truer words have never been spoken! Working in modern-day America typically means that you are bound to the 9-5 “daily grind”. Your life now revolves around setting an early-morning alarm, commuting to work, punching the time-clock, working 8+ hours, going home, and doing it all over again the next day! If you are not passionate about your work, this lifestyle can become a major source of unhappiness. Depending on your current career path, you may be experiencing heightened levels of stress and dissatisfaction. Perhaps you are thinking, “How did I get here? I hate my job!” As a result, you are probably suffering from a total lack of work-life balance, never finding a way to detach yourself from your work, so you can enjoy your personal life. This type of exhaustion is not normal – it puts you in an unending fog. Before you get out of bed in the morning, you already feel tired. Just waking up to the thought of going in to work makes you feel fatigued. This isn’t just a physical exhaustion; it is also a mental one. Your personality dims and the things that once excited you seem tedious. When you get home from work, all you want to do is curl up on the couch and do something that requires 0% effort. The days of going out with friend or accomplishing a goal are over. You are too tired to care anymore. Are you getting constant headaches, stomach problems, or shoulder pain? These are key signs that your stress levels are too high and you need to step up your self-care routine! For me, it started with debilitating headaches and neck pains. Then I started to have serious digestive/gut issues (painful bladder infections, constant acid reflux, and constipation). I began to gain weight even though I wasn’t eating badly. My nervous system began to act up. I would wake up at night shaking, shivering and sweating. I began to get anxiety. I had NEVER suffered from anxiety a day in my life. What was happening to my healthy body! After visiting several doctors, I found out that my body was responding negatively to the level of work-related stress it was constantly under. My body was signalling for me to SLOW DOWN! Over long periods of time, chronic stress can take a debilitating toll on a person’s health. My doctor informed me that stress is related to heart disease, diabetes, obesity, depression, and gastrointestinal issues. Finding ways to effectively relive your stress is an important step to making your health a priority. Even though you are off the clock, you cannot stop thinking about your job. The project you are working on, the deadline that is coming up next week, your demanding boss – you cannot stop thinking about them! As a result, this increases your stress levels and does not allow you to mentally and physically prepare for the next work day. If you do not address this problem, it will take an effect on your job performance and health. You used to have an immaculately clean work-space and home, but you don’t anymore! You have too much to do at work and you are too tired to clean when you get home. Even though your inner neat-freak may have quieted down, the mess is still making you feel unbalanced and stressed. Before leaving work each day, try to get your work-space in order – even a little bit! And when you get home, try to tackle one specific cleaning project at a time. The hard part is getting started! Once you start, you will be surprised at how quickly you can clean a room. This was a major problem for me. I would lay awake for hours each night – getting an average of 3-4 hours of restless sleep. I allowed myself to take sleeping aids twice a week because I did not want to get hooked. One night, after months of this, I broke down sobbing. I couldn’t go on like this! I was getting to the breaking point of exhaustion – Burn-Out! If you find that you cannot sleep at night, try these nighttime habits for better sleep. As your work-life balance declines, you may start to respond to others in a negative way. Perhaps you are becoming increasingly argumentative and negative. Or you are withdrawing from the world, preferring to be by yourself instead of with your family and friends. While it is normal to occasionally experience negative emotions, you must identify when they are becoming a normal part of your life. I had always been a “people person” and loved being with my friends. However, I began to turn down party/event invites to stay at home curled up on the couch. I felt too tired to socialize with others. This behavior only left me feeling depressed and alone. It felt like a vicious cycle. Your work-related sadness follows you everywhere! Get-togethers with friends, weekend events, and even vacations are always overshadowed with the thought of returning to work. This mindset is going to take the enjoyment out of precious moments and ruin what should have been good memories. If you get to this point, perhaps you should consider changing your job or talking to your supervisor about more reasonable work expectations. Beware of the grumpy co-worker, spouse, or parent! When you find yourself in a unbalanced work-life situation, you start becoming moody! It is very difficult to maintain a positive outlook when you are stressed and unhappy. However, happiness is a choice and you must find ways to choose positivism! Try these habits of people who live a happy life! Don’t feel bad about this one! Did you know that 40 million adults in the United states suffer from anxiety? Whenever you start driving to work or even thinking about work, you start to become uneasy, apprehensive, and your chest starts feeling tight. Anxiety can either control your life or you can learn to control it! This article will give you the ways that I have successfully learned to manage my anxiety. Whether you have mild or severe anxiety, there are always ways to manage and treat it yourself or by way of a medical professional. 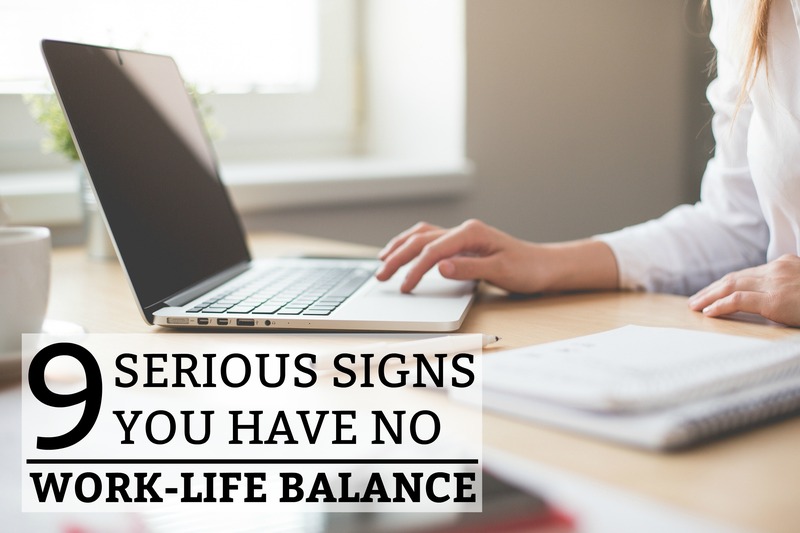 Now that you have identified that you have a problem with your work-life balance, it is time to get it under control! If you need to leave your job, read this article. However, if you are going to remain in your current position, you must learn to find ways to enjoy your current position. In the end, you must take some time to identify your priorities. Don’t sacrifice your passions, happiness, and relationships for a job you hate or an unhealthy and obsessive work mindset.